methinks the HELMET got yanked, as WELL as the knobby rods atop her head. way ta' sell a product people!!!!! 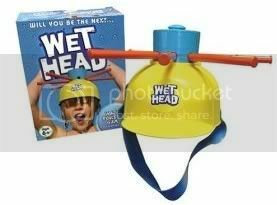 and is this NOT just a bowl of water being poured down someone's head, minus the choking devices? heh, I didn't find a link, either. Poking around, though, it looks like it's supposed to be more of a Russian roulette kinda game - only one of the rods releases the water. i SOOOOO wish i were internet/youtube savvy, cuz i would've shared what i saw in a hot second.